There are changes underway at Family Tree DNA to the way that matches are presented, particularly Family Finder autosomal matches. As long as you have certain close relatives who have tested — first cousins or closer — and as long as you link those close relatives in your family tree, then as long as other matches match both you and those close relatives at a level that allows a confident conclusion that the match is coming from that side of your family, your Family Finder matches will be designated as maternal or paternal. That can be a useful tool, once it works as fully as it might. But we’re not there yet, and the change to make this reporting system work has caused other issues that need to be addressed. So the operative phrase here has to be: work in progress. First of all, the system is slow. Slow slow slow. Choose someone you want to see the in-common-with matches for, and it takes 10-30 seconds or longer to load when it used to be pretty much instantaneous. Throughout the system, the grey loading message bar appears all too often and stays around far too long. Second, the system of linking people who’ve tested to your family tree so their DNA is used for the matching system is cumbersome, and it’s almost impossible to enter second and later spouses and half-siblings to the mix. Third, even once you get everyone entered correctly, not everything is working the way it should. Here’s a key example: one thing most of us like to do is see what matches we have in common with a person and then compare those matches in the chromosome browser. So it used to be that you’d select the person for whom you wanted to check the in-common-with matches, then use the advanced features field to select the five you wanted to see in the chromosome browser from the list that appeared. The problem now: once you select someone to be in-common-with, you can’t select anybody to go into the chromosome browser. You have to write down the names of the people from the in-common-with match list, exit out of the in-common-with list, and then and only then can you add them to the chromosome browser list by searching them out on the bigger overall match list. Perhaps even worse, you can’t select people for the chromosome browser from different pages of the match list. Select two from page one, then go on to page two to select two more, and the two from page one have disappeared from the selections. And even the new matching system — helping show maternal versus paternal relatives — doesn’t work as well as it could, because half-siblings aren’t triggering the paternal versus maternal matching. That’s a real shame, since they’re the most direct evidence we have, if our parents are gone, as to which side a match may be from. With luck, that’ll be on the “feature-to-add” list real soon. Now Family Tree DNA has made it clear that there’s work being done on this system this weekend, so we can hope that some of these will be addressed sooner rather than later. For the moment… work-in-progress is the best that can be said. It’s sure not ready for prime time as it is. Submitting a new GEDCOM file was impossible last night. Now I have one of those infamous one-person family trees which I hope can be replaced within a few days. I’ve been unsuccessful in loading new GEDCOM. Tried different files. Submitting Help tag but obviously it’s on their end. I’ve encountered exactly what Judy documents in her piece. Indeed: NOT ready for prime time! It’s going to take a while for all the kinks to be worked out — assuming (hoping!) they can be worked out. No, you don’t have to write it down. You can just open two windows, one for “in common with” and the other for the chromosome browser. That’s better than nothing, I suppose, but isn’t a very good solution to taking utility away. I am having trouble with my origin will not load people that I am related to. Is anybody else having this problem? Give it a day or two, Sandra. Lots of people are having problems. Thanks Judy for this. I think FTDNA has fundamental problems with its IT infrastructure which is in part the issue you describe here. As a former IT executive, I’ve seen what “underpowered” infrastructure will do to seemingly robust programs like this. I’ve been watching this site for the past several months and have observed slowness of execution for even the most elementary tasks/requests. This should have be worked and planned into their overall architecture, but I fear it wasn’t. Time will tell if they can deliver. I sincerely hope it can, Larry — having FTDNA as a viable option (and competitor to other companies) is important to genetic genealogists. Does FTDNA see themselves as a software company or a genetic testing company? The obvious answer is the latter. But if you think about it, managing nearly a million tests and performing billions of complex calculations every second requires state-of-the-art hardware, software, and engineers to make it work. Time will tell where FTDNA has been investing their money and time. I’m a long-time customer and rooting for them but years of slow performance, outages, and unwanted notifications leaves me skeptical. Granted, a few changes were necessary to eliminate some awkward maneuvering in Family Finder. But why has FTDNA subjected thousands of its customers to this mess? As a Systems Analyst (and Assembly Language Programmer) in the 1960-70’s, we designed systems thoroughly and then tested new and modified programs exhaustively before putting them online. That’s the time to find the bugs – not after users depend on its accuracy. Plus, changes were never made to a system that would eliminate its current useful output. This just shows incompetency. Makes one wonder about the accuracy of system’s data. I have found no software is tested thoroughly anymore and it is extremely frustrating. FTDNA has always been slow, but has become so slow, that I almost never even look at it. I receive messages that I have a new match, but find nothing when I look. I think I no longer even know how to use the site. I loaded GED’s etc. and have two nephews DNA that I administer and my own autosomal DNA there. I can no longer figure out what is what about anything. I tried e-mailing with the help desk, but they were not helpful in trying to straighten out what I had so it would be usable. I hope this can be fixed soon, my accounts straightened out a something of a user manual developed. I realize that takes money, but I would buy a manual if it were good. Check your magnification level. You may need to decrease the size until you get a full screen option again. At least Ancestry.com allows one to select a page they want. With FamilytreeDNA I have 1048 pages and have to go one by one. Tedious is too mild a word. Because I didn’t start checking my matches for a couple years, there are some matches I have never seen because they are too far back in the pages. 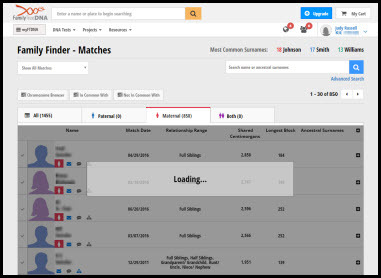 Download all your matches to Excel and you can review them all easily offline. I can’t seem to get an answer to this question. I uploaded a GEDcom to the new FTDNA tool. Since then, I have made some additional changes on my Ancestry tree. If I upload a revised GEDcom to FTDNA, will it still keep the DNA links or will I have to do it all over again? Thanks!! Until I can test it, that’s a question I can’t answer! Have paid, about 1/2 a yr ago, for a test between myself and a purported niece. Am keeping the faith, altho communication is a rare event. Waiting. Waiting. Waiting. When will I hear a yes or no result, and can they not keep me informed of progress? Frustrating. That’s a very long time for a test to be delayed. I’d contact customer service and ask. WHERE is the new FTDNA tool? It’s at the top of the match list, under the tabs for paternal and maternal sides, but won’t get populated until you link specific relatives who’ve also tested in your family tree. See the explanation from FTDNA here.